I recently wrote a blog post in which I asserted that the Buffett Rule (as proposed by Sen. Sheldon Whitehouse) could cause a marginal tax rate of 90% on particular types of income. That analysis was based on a misreading of the bill and a misunderstanding of how the phase-in would work. I had originally thought that the phase-in fraction applied to the new minimum tax itself; it actually applies to the excess of the minimum over the taxpayer’s normal tax liability. Practically, this means that taxpayers will start feeiling the effects of the tax as soon as they hit $1 million in AGI, but the phase-in is spread out over the whole $1 to $2 million range, rather than (as I wrote before) suddenly kicking into high gear around $1.8 million or so. The effective marginal rate caused by the bill is a complicated function of the taxpayer’s AGI, his or her regular tax amount, and the marginal rate on his or her regular tax. I will post the exact formula and its derivation soon, but I did want to put this correction out there as soon as possible. The fault is mine alone, and I should have read the bill more carefully. Update: To put some hard numbers on it, I’ll use the example I did previously. 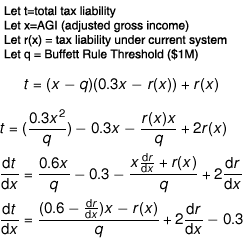 I’ll assume a taxpayer with $1.8 million in capital gains (and no other income) – this isn’t realistic, but it’s the sort of situation that leads to high marginal rates under the Buffett Rule, and it’s worth seeing what the theoretical maximums are. Such an example shows clearly how the rule would work in practice. Assuming 2012 tax rates and brackets, this taxpayer would have $263,235 in tax liability under the current system. The Buffett Rule minimum is 30% of $1.8 million, or $540,000, and the difference between them is simply $540,000-$263,235, or $276,765. The phase-in fraction is, as before, 0.8, because the taxpayer is 80% of the way from $1 to $2 million. That $276,750 therefore gets multiplied by 0.8: $221,412. This is the amount that gets added back on to the taxpayer’s regular tax liability, and his or her total burden is $263,235+$221,412, or $484,647. A 90% rate is only possible if the taxpayer has just under $2 million in income that would otherwise not be taxed at all. I can’t imagine such a situation realistically arising.